Toribash. The game that looks like there is absolutely nothing to it but ragdolls. The game in which you probably would see a picture of it and flip through to the next one. But really, it’s a game in which you have to try. Toribash came onto steam as of May 16th 2014 but has been out since 2006. And yet, people are still playing it. It absolutely lives up to the description. It’s fun, and totally addicting. It is a little hard to learn straight out of the box but once you get the hang of it, you start ripping off arms and kicking heads in. So lets get to the Toribash review! 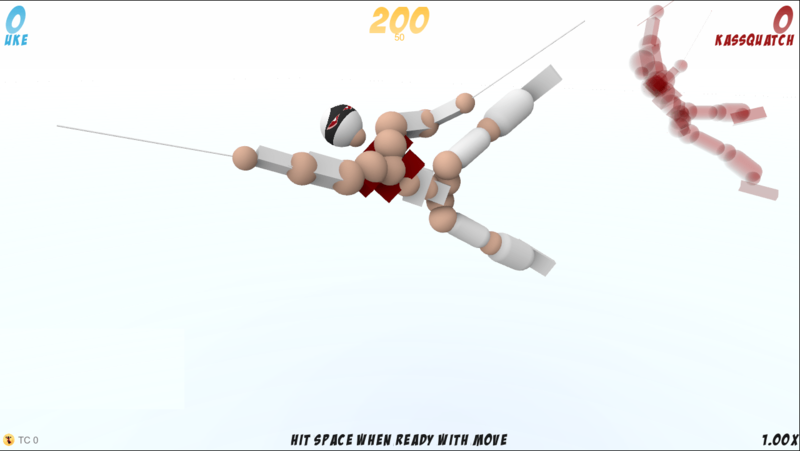 If you have ever played a ragdoll game, you know what a ragdoll game is. If you don’t, it just means in layman’s terms, what you do to one part of the body, affects the other. This game puts you against another ragdoll player. It’s turn based in which you set up what move you will do next. By move, you contract or expand each joint which moves your body parts. The goal of the game is to beat the other play by either getting them to move out of the ring, getting them to hit the ground first, or dismembering them. The process of getting them there, that’s is where the fun is. Kicking heads off, ripping of arms, breaking legs, all part of it. The main problem with this game is the amount of time it actually takes to get to fight another player. You sit in a queue, waiting for your turn. The winner of the fight keeps fighting, the loser goes back into the queue. So if you are good, you keep playing. If you were like me, and it was your first time playing, you wait 10 minutes to get your first match, lose instantly, then wait another 10 minutes for another chance. Something needs to change in that aspect if it wants to keep more players. When and if you do win, you gain Toricredits. You use Toricredits to customize your character. You can also buy Toricredits to do this. That is the nice thing about Toribash, you can’t really pay to win. If you don’t want to wait to fight actual real people, you can always go to free play mode, and beat up another doll. You can learn moves this way. I wish I knew about this before I went straight into playing against other people. Playing solo you can come up with awesome combos like in the video below. You can also load mods into the game. There are to many to list but if you go into the setup menu, you can load the mods. Rocket swords is the mod loaded in the picture to the right. Along with the mods, you can watch replays that other people have done. When you load the mods or play in free play, you do not gain Toricredits. The graphics in the game, are simple. Circles and rectangles. Thats it. But, they are high definition circles and rectangles. They are very clear and crisp. The audio in this game is simple. Background music and combat sounds. Oofs and ughs mixed with punch and kick sound effects. They do a good job of matching to the animation. The background music is very “Zen” like. Calming yet you know some kung-fu action is about to happen. The game isn’t going to hold you with fancy graphics and audio immersion. But it definitely will hold you with exciting combat and crazy ragdoll physics. Toribash won’t hold your attention for hours at a time, but for 30 minutes or so if you have some time to kill, you will definitely have fun doing this. Would I recommend you to play Toribash? Yes. It’s free to play, not pay to win, is only a 64mb install and ragdoll’s like no other. Next Article 50% off the Warhammer Dawn of war Franchise on Steam!